The past few days have been pleasant and seasonably warm; typical weather for early May. Today the high temperature was near 80 degrees, and it was pleasant and dry. Unfortunately, this stretch of dry weather is what is keeping the pollen count so high. Tree pollen and grass pollen levels were very high today, making the outdoors pretty miserable for those with allergies. This pattern is likely to continue, but if you can muster up the strength to get through the end of classes this week, then you can hide inside away from pollen until finals. Tonight the sun will set at 8:08 pm, and temperatures will drop into the mid 50s overnight. Skies will become partly cloudy with slim to no chance for any precipitation. Winds will shift from Easterly to Southerly overnight, which will start to bring warmer air into our region. Tomorrow the high temperature will reach up into the mid 80s, which is aided by Southerly winds bringing in warm air. Skies will gradually become mostly cloudy, providing intermittent relief from the strong sun. 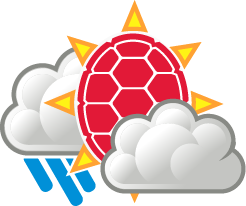 There is a slight chance of scattered showers throughout the day, and thunderstorms likely in the afternoon. Pollen will remain high. After around 8 pm the chance for showers and thunderstorms will go away. Skies will begin to clear, and the low temperature will be in the upper 50s. Winds will be light and variable, and overall, it will be very pleasant outside. Friday will be nice AGAIN! The high temperature will be in the upper 70s, and skies will be sunny. Saturday will warm up even further with a high temperature in the mid-to-upper 80s. This weekend there is a chance for showers and thunderstorms, which could remove pollen from the air, making it a little more bearable outside. For now, the pollen is still expected to stay very high, so be prepared to do some rain dances this weekend. 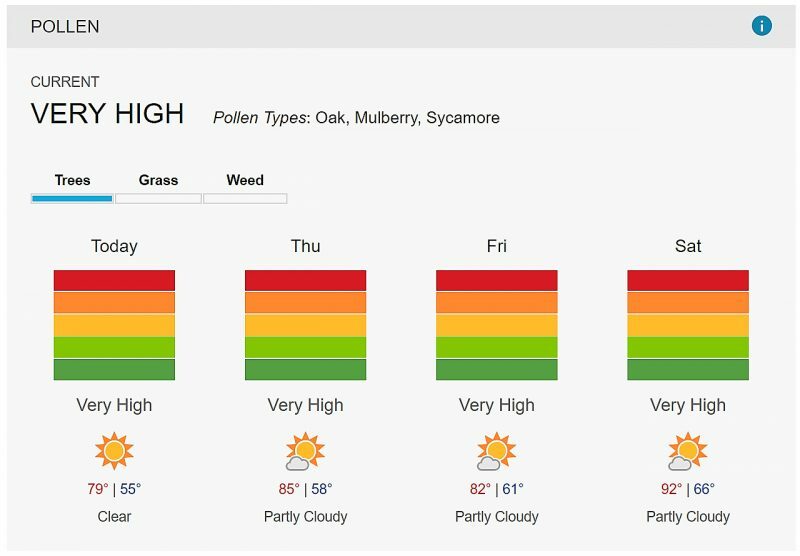 This pollen report shows pollen levels over the next several days, including what type of pollen is present (via Weather Underground).